Giant Step launches ComicReply™ beta product at the Ontario Pavilion, 2012 Annecy International Animation Film Market (Mifa) conference. The Ontario Exports trade mision to Annecy is also supported by the Ontario Media Development Corporation (OMDC) Interactive Digital Media (IDM) Export Fund. 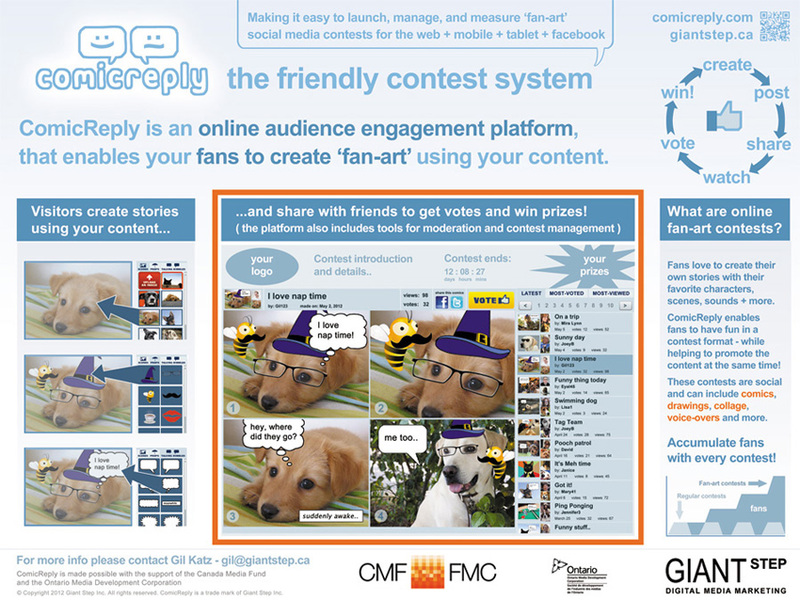 Giant Step, a leading Canadian digital media developer announces the launch of the ComicReply™ beta, an online contest platform that enables content producers and brands to leverage the power of online ‘fan-art’ in a contest format. 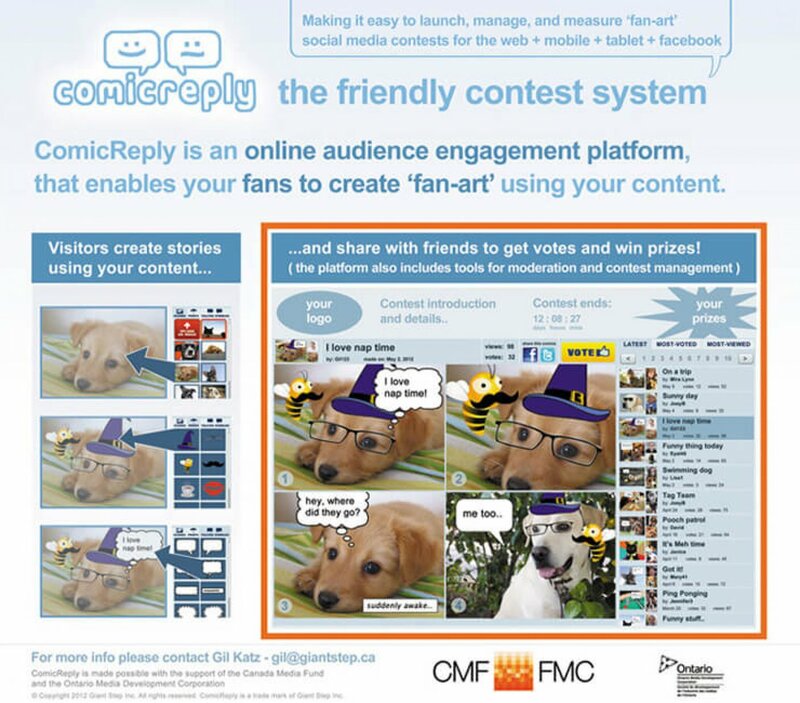 Focused on moving beyond photo and video contests, the ComicReply™ platform enables the creation of branded personalized multimedia ‘fan-art’ such as branded comics, where fans can create their own stories using images from a film, TV show or a brand’s original content elements. 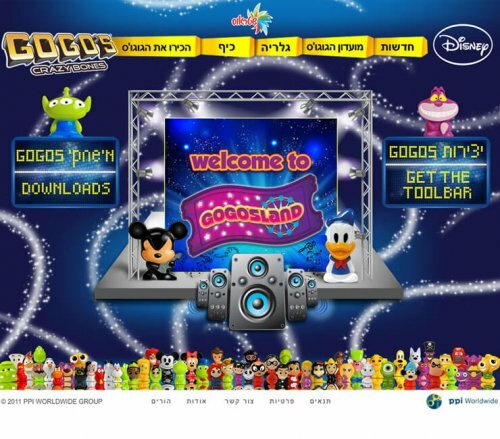 Fans select a background image, add props, talking bubbles and submit their creation to the contest. Submissions are moderated and then posted onto a public gallery for audiences to ‘Watch & Vote’. At the end of the contest period, creators of the most-voted ‘fan-art’ win prizes. As participants share their creations with family and friends, they accumulate votes while the brand benefits from greater exposure and measurable marketing results. This new formula for audience development has already proven to generate excitement and participation for several brands, and introduces a new marketing vehicle that is both fun for audiences and valuable for producers. Advertisers often create ‘viral promotional content’ with the hope that people will share it online, but most of the time it does not ‘go viral’. Giant Step discovered that ‘creativity contests’ where the viewer is provided with an opportunity to ‘play with the content’ (by remixing it to produce personalized stories) is a lot more fun and also more effective as people are more likely to share their own creations with friends. Since every ‘share delivery’ also includes a promotion for the original content, the contest extends the brands’s reach while providing greater entertainment value. Essentially, for the price of a video that may or may not be viral, a fully-fledged ‘viral-content-generation machine’ can be installed and run mostly by the fans. ComicReply™ contests can also be integrated on the web, facebook, and mobile devices. 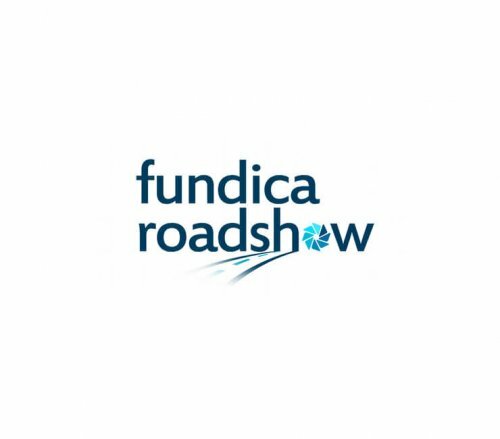 A minimal contest system can be customized and launched for under US$10,000. Contests can range from one-time online promotions to multi-platform ‘engagement machines’ that are re-used many times and accumulate ever more fans with every contest! ComicReply™ was made possible with the support of the Canada Media Fund.